The sight of people begging on our streets is shocking to some; to others it is just part of the Oxford scene. Either way, many people feel that there must be a better way to give to individuals in need. The Oxford Poverty Action Trust has been set up to provide people with an opportunity to give to homeless, needy people in a direct way. OxPAT is administered by a Committee and a Board of Trustees, both composed entirely of volunteers. The original idea was to place collecting boxes in public places. Nowadays most of our money comes from standing orders, cheques and other donations. Donations are distributed via agencies working with homeless and vulnerable people. In this way money goes directly to the most needy people, not just to those who beg. Small grants are also given by this means to individuals. The money given can be used for anything from clothes, toiletries, fares or food, to essential items needed when a homeless person manages to find a room to move into. Applications are invited and received from Network agencies; and the Trustees meet monthly to distribute funds. Most of Oxpat's income comes from private donations made by members of the public. Many supporters pay money to OxPAT via a regular standing order. This is a particularly valuable way to donate because it provides a regular and foreseeable source of income, which can be depended upon. Individuals make charitable donations to OxPAT from time to time by cheque. 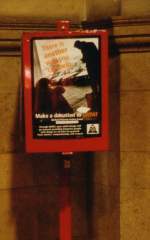 OxPAT collecting boxes can be found in a number of local stores, offices, colleges and other businesses. The money collected goes directly to OxPAT. If you would like to make a donation, please visit our donate now page where you can download forms for standing orders and gift aid. Over £440,000 has been collected and distributed since the organisation was launched, and the total is growing all the time. Every penny donated to OxPAT is distributed to organisations providing shelter, food, day centres, clothing, advice and medical care to people in need. See What we do for a list of organisations we support.